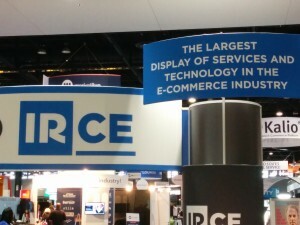 We’ll, another year, another IRCE show. This was another great year attending the nations largest ecommerce trade show. It was great seeing our clients, friends and colleagues at the show and being able to network with other industry professionals. One challenge with this particular show is that EVERYBODY in the industry showcases their brand at this show, so it is difficult to grasp who the key players really are within a specific category. That’s one of the reasons AIC attends all of these shows, because we speak to all of the vendors so that our clients don’t have to. We help clients navigate through these difficult waters without all of the headaches trying to figure out who are the best vendors to meet any given need. If you ever need help selecting an ecommerce platform, solution provider or marketing service, reach out to AIC for a free consultation. For more photos of this event, check out our Flickr page. This entry was posted in Blog Posts, Industry Conferences and tagged Industry Conference, Internet Retailer, Internet Retailer 2015, Internet Retailer IRCE 2015, IRCE, IRCE 2015. Bookmark the permalink. ← Do we care what our customers think? What they REALLY want?